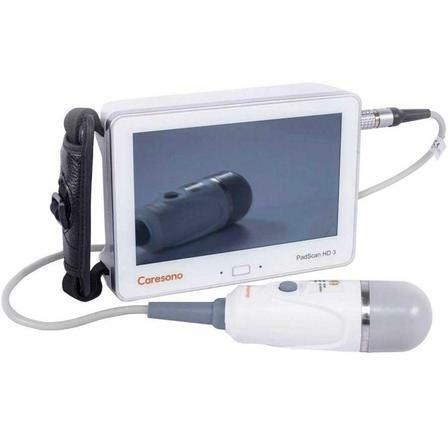 Caresono PadScan HD3 Bladder Scannerat the lowest prices! Caresono PadScan HD3 Bladder Scanner The next generation of Bladder Scanner. Download Document of Caresono PadScan HD3 Bladder Scanner. The Caresono PadScan HD3 Bladder Scanner includes an ultrasound transducer, probe cup, docking stand, two batteries, USB data line, AC wall adapter, 14 V power connection line, printer paper, CD (with upper computer software and user manual), charger, screwdriver, and a carry case with two keys. The PadScan HD3 features real-time, high resolution 3D ultrasound images and measures the urinary bladder volume quickly, safely, and automatically, all in a non-invasive manner. A bladder scanner is a non-invasive, portable ultrasound device that provides a virtual 3D image of the bladder and the volume of urine retained within the bladder. Retained urine is a reservoir for bacteria and pathogens, which can cause urinary tract infections, leading to damage of the renal structures, pain, and sepsis. Bladder scans are commonly utilized in acute care, long-term care, and rehabilitation environments, as well as in physicians' offices. Without the use of a bladder scanner, urinary retention is assessed by performing an invasive "in and out" urinary catheterization, which can be uncomfortable and pose a direct risk of introducing more pathogens into the bladder, increasing a patient's risk of infection. "Pad" style unit with carry handle. Volume Measure Range: 0 - 999 ml. Power at the State of Charging: 40 - 120 VA.